The Mozilla Thunderbird is an open source e-mail client developed by the Mozilla Community. Thunderbird client is easy to configure. It contains an entry of each configured accounts and its subfolders. Though thunderbird provides a user-friendly contacts list, it does not contain calendar or task functionalities like Outlook where it is provided by default. The Thunderbird users have options to install extensions that allow users to avail these features. It does not support MS Office applications like Outlook. Thunderbird uses MBOX file for storing multiple emails for one mailbox. The Microsoft Outlook is an email client having calendar and task tracking features. Outlook is supported with many MS office applications like MS word, SharePoint etc. The users of Outlook can send & receive meeting invitations and share calendar with other Outlook users on the network. Outlook is not an open source application that means it is not free. The application stores its data locally within a single data file called Personal Storage Table (PST). Outlook is easy to set up using auto-discovery & the set up process is driven by a wizard if manually configured. 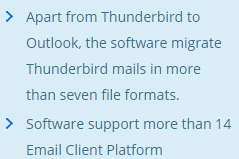 Thunderbird to Outlook Migration is preferred by many users as Outlook provides a secure enterprise email-client option with cross-program functionality that is integrated with various Microsoft Office applications. Outlook is considered safer than Thunderbird as the PST file used for storage of single account cannot be configured in any other system unless the previously configured account on the system has been removed. In addition, the MS Outlook provides a logical link to Microsoft Exchange server. Manual methods for exporting Thunderbird mails to Outlook requires drag and drop of the EML files from Thunderbird and Open the EML file in Outlook. Drawbacks of manual procedure are broken images, Loss of SMTP headers and is time consuming. Thunderbird to Outlook Migration tool provides easy solution to export all the emails from Mozilla Thunderbird to MS Outlook PST file. The software recovers all the data items from corrupted files at a time without any type of data loss. The Mozilla Thunderbird file of any size can be scanned and converted into UNICODE PST file using this migration tool. It provides easy to use interface for conversion and supports multiple Email preview modes like Hex, Properties, RTF, Message header views etc. MailPro+ is a reliable solution for flawless migration of Thunderbird to Outlook PST. Each emails are migrated to the PST file keeping all the Meta data of the mails intact after the conversion. Can I migrate the important folders that I have created on Thunderbird to Outlook platform? Does the software restrict the migration of email messages beyond a particular size? The application extends the scalability to migrate as many email messages to Outlook without any restriction on the file size. I was looking out for a proficient Thunderbird to Outlook migration tool that would help me to migrate the data I have on Thunderbird to Outlook platform. Then, I came across your product Thunderbird to Outlook Migration utility and believe me it really did wonders for me. The application migrated all the emails from Thunderbird to Outlook without any data loss. This is the tool that I have been looking for; it works in an outstanding way to alleviate all my concerns regarding Thunderbird to Outlook.